It's not every day that you get to interview a former great Wisconsin football player and one who is playing on Sundays. Nonetheless, I was able to land an exclusive interview with former UW and current Carolina Panthers punter Brad Nortman. While Nortman is known to fans for his two fake punts in 2010 against Iowa and TCU, respectively, he sits third all-time in program history with a career punting average of 42.1 yards per punt, sits fourth with 8,383 career punting yards and fifth with 199 career punts. In his first year in the National Football League, Nortman averaged 43.0 yards per punt, averaging 44 or more yards in four of his last five games. He also had a season-best 48.3-yard net average in Week 16 against the Oakland Raiders. Rex Sheild: Brad, you just concluded your first year in the National Football League with the Carolina Panthers. How difficult, if at all, was the transition moving from Division 1 college football to playing with the best football players in the world? Brad Nortman: It's definitely a step up in everything really―the leash they give you to kind of improve yourself is a lot shorter, the standard is a lot higher. You're always aware that you could be cut any day. It's not like college where they're stuck with you for four years. It's a little bit more of a risky venture you could say because it's not a long-term thing for most guys anyway. Luckily for me for punting, it's the same motion, it's the same catch and kick like it was in college. All the extra things like getting paid, treating it as a job and all those kind of things play a little bit more of a role. RS: Speaking of getting paid with an NFL contract. Since you were on scholarship at Wisconsin, looking back do you now feel that college athletes should be paid any form of stipend for the amount of work they put in? BN: I think there's two ways of looking at it. Looking back at it, I feel though personally the scholarship that you're given is the biggest gift they could really give you. To come out of school with a good education and to be able to hopefully have no debt and all that kind of stuff, that's huge for a lot of guys as compared to everyone else coming out of college. It really sets you apart from everyone. So I think in one way you're rewarded and you're paid in a sense just through the scholarship. On the other end though, you see ESPN, ABC and CBS―you see all of these big-time companies and the university itself are making money off of what you're doing. So it wouldn't hurt to be able to see a little bit of that yourself. There's two schools of thought: you're already paid in one way in my opinion through the scholarship but maybe a little bit more toward your room and board wouldn't hurt. I don't think they should be paid an exorbitant amount of money like you are in the NFL because I think that takes away from the amateurism of it but a little bit more wouldn't hurt because all college guys are aware of how big business college football actually is. RS: During your four years at UW, you were on back-to-back Rose Bowl teams and back-to-back Big Ten championship teams. When you look at all that talent that was there, the offensive line in 2010, Russell Wilson and Montee Ball (in 2011) - what sets those teams apart from the two teams you played on previously your first two years? Again, when you look back at all that talent, how kind of disappointing, frustrating is it that you guys couldn't get a W in either of those games? BN: I think the difference between the years that we were highly successfully in going to the Rose Bowl and years that we were just moderately successful, there were definitely a sense of togetherness that the two latter teams had. Obviously the talent was there but there is talent with a lot of teams that can't necessarily put it together. There was a togetherness. There was a drive. I think there was a bitter taste in our mouth from my sophomore year going into my junior year from not feeling we got the respect we deserved. Then my senior year going off of a Rose Bowl loss, I think it's that drive, it's that motivation, that lack of sense of entitlement that a lot of teams have that tend to flounder. A lot of teams have a lot of talent but they go in thinking they're going to roll everybody over and have a sense of entitlement. They're going to find themselves in a bad position. If you have the ingredients of good talent and then a drive, a motivation―almost like a workman's-like attitude, very humble―I think those two combined is what the team that I was on in the Rose Bowl years had compared to the first couple years where we kind of felt we were on top of the mountain and really hadn't achieved anything yet. [In response to] your second question was the salty taste in your mouth after the Rose Bowl that was certainly there. You look back and you don't necessarily take for granted the talent you had but you don't really see it coming to an issue until you see all of these guys doing well in the NFL, too. You look back and just going through our offensive line and our whole offense and defense those two years. All the guys in the NFL or had a NFL opportunity [is] a rare thing to have that much talent on one team. It hurts (laughing), you never quite get over it to be honest with you. RS: Going off that, too and not to beat a dead horse, but Bret Bielema last June said that Devin Smith was the missing link to you guys being a national title contender. With what you just said about all that talent, do you feel that 2011-2012 team with everyone healthy you could have been a legitimate national title contender? BN: Definitely. I think just based on who we had and who we had healthy we were a legitimate title contender. You know the two games we lost were rarities. They were based off of a Hail Mary play, which is a lot of luck-based. Looking back, that would have been the ingredients for a national championship game. With everyone healthy, there's hard to see any weakness on our team. Having a guy like Devin in there to sure up the opponent's passing game, there really wasn't a weak link. I think that could have been the difference. RS: Obviously, Bret Bielema left UW to go to Arkansas. It was reported or alleged that in the team meeting before he left on that Tuesday, he said he wanted to win a championship. He later said he meant an SEC championship, so anyone can read whatever you want to read into that. If your coach―him in particular since he coached you and recruited you―said that to you and the team that he wanted to leave because he wanted to win a championship, how would you feel about that? BN: Like you said, it's hard to know what was actually said in the meeting because only the players and coaches in the meeting actually know. It's always a personal choice unless you're fired of course from a coaching staff. I'm sure there are a lot of things that went into his departure in going to Arkansas. I'm confident in the Wisconsin football program. I think some day we'll reach that national championship level. We already scratched the surface so I think we have the capability to do so not only to be Big Ten title contenders but to be national title contenders. I don't know what was said but I personally believe that Wisconsin is―every year we're ranked, every year we're right there–but so is Arkansas I think every year, too. They have the talent. It's tough to say really but, as a player, having a coaching staff leave is kind of tough because you have to prove yourself to [new coaches] that you don't know and didn't necessarily bring you in. It kind of puts the kids in a tough position but with that being said, they know how college football is. Going back to our first thing, it's a big business so they know how it works and it's all part of the game. RS: Except two guys - Ben Strickland and Thomas Hammock - there will be a whole new coaching staff at UW. You yourself went through a positional coaching change during the season with Carolina so you're used to coaching changes. Going forward, how do you think those kids will respond and do you think Coach Andersen will be able to sustain that success next year and going forward, especially with Ohio State and Urban Meyer on the rise? BN: It's sustainability. I think it's having a sustainable formula for success and it all really starts with the head guy [meaning] Barry Alvarez. He sets the tone. He still does and did when I was there. He sets the tone for how the program is run, what kind of guys we recruit, what kind of attitude they have and what kind of sustainable game plan to go with. I've heard good things about the new coaching staff. I'm sure they'll do great. [I think with] the guys we have and the Wisconsin football mentality, it is a sustainable formula for success. You're not going to have your huge ups and downs. Every year they're going to make a bowl or get close to it. They're always going to compete for a Big Ten championship or more so I think that's the best part. A lot of teams don't have that formula and we've had for a long time. It's a bright future for Wisconsin football. RS: Brad, one final question. Five years, ten years from now and beyond when Wisconsin fans say 'hey remember that former punter Brad Nortman' and your name comes up in conversation and what not, how do you want Wisconsin fans to remember your career both on and off the field? 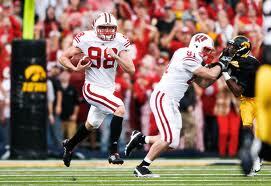 Nortman running a fake punt for 17 yards which led to a win at Iowa in 2010. BN: I think that's a good question (laughing). I think it will automatically come up with a couple of the fake punts I ran. It still comes up to this day. It's only been a year removed but that still comes up. That's not necessarily the worst image to have. Hopefully, they look back and say I was an important aspect of successful Wisconsin teams and on the field of course that I was able to do my job to the fullest and put our team in good positions. That's all I could really ask for and to be linked to such good teams and be viewed as an important aspect is more than I could ever ask for. Off the field, [I want to be remembered as] a guy that was a good teammate, that was never selfish. If I can be those two things and maintain with a good image of character, that's all I really care about.